Aerial view of Cosford airshow last year. The Liverpool Telescope forms part of the National Schools' Observatory exhibition at this year's Royal Air Force (RAF) Cosford Air Show on Sunday 11th June. The event is the RAF's only official air show, and regularly draws a crowd of 50,000 or more. Several hangars are open to the public, hosting exhibitors from around the country. One is named the "Space Hangar", and is devoted to the subjects of astronomy and spaceflight. The National Schools' Observatory (NSO) exhibit takes up part of that area. The NSO exhibit is aimed primarily at children, featuring hands-on activities and movies. The Liverpool Telescope (LT) section will be attended by members of LT staff, on hand to answer questions about the facility and its proposed 4-metre successor "LT2". It will also feature life-size mockups of the LT and LT2 primary mirrors. 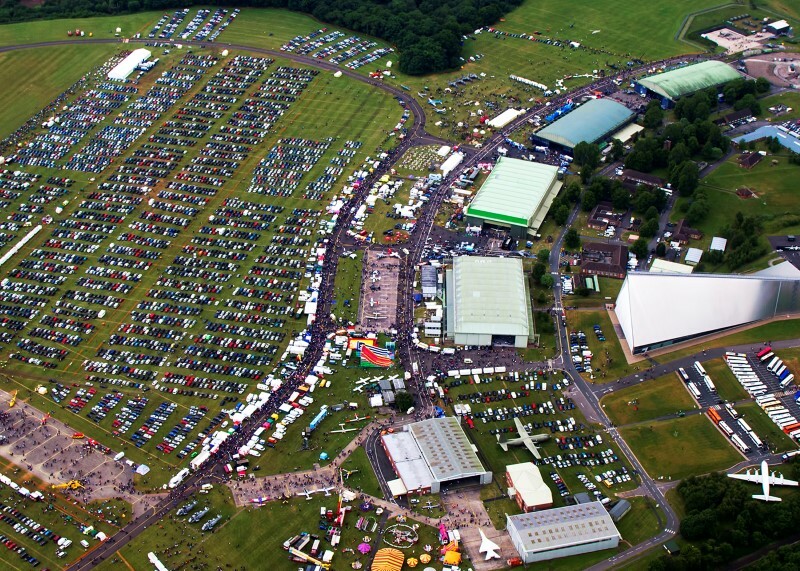 Tickets to the airshow cost £25 and are advance sale only — there will be no tickets available to purchase on the gate. Tickets can be bought online, by phone or from selected outlets; see full details at the offical airshow website.